How I know when the piece is finished? Knowing when a piece of art is finished is a very important part of making art and not as easy as you would think. 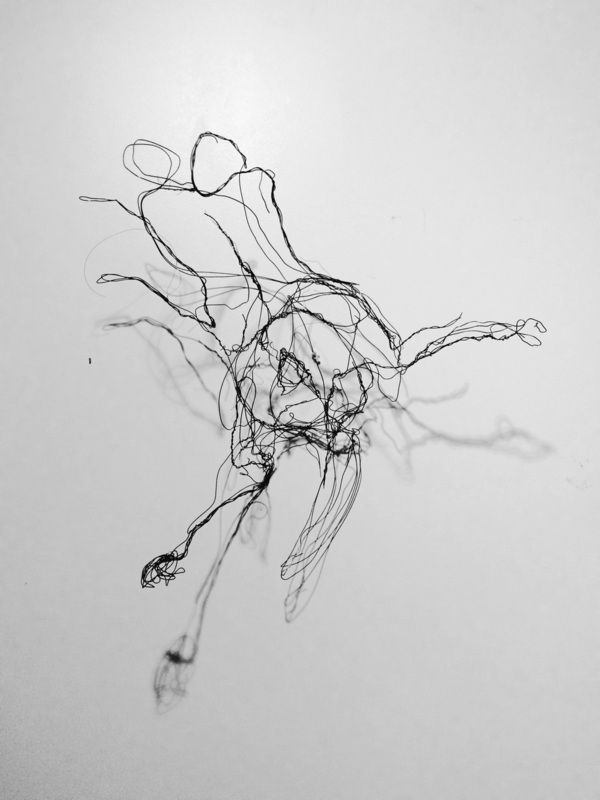 The luxury of sculpting in wire is you can over work a piece and then undo what ever you like. In this case I have decided the tail, hind legs, and abdomen tell the viewer everything they need to know. The head, ears, neck and front paws were fine but I think the piece in the below state makes a better piece of art. The viewer knows that this is a dog. The dog is in a relaxed, happy non aggressive state of mind. Removing the head, ears, neck and front paws really expresses more energy and more excitement. I guess you could say it has a "happy ending". In fact "happy ending" could be a great title. It also works really well on a wall and or on a pedestal. "happy dog - tell-tail "
32" X 28" X 13"